The GE WPDH8800JMG 4.2 IEC Cu. Ft. Frontload Washer comes equipped with various features including the highly innovative Cleanspeak Communication System. 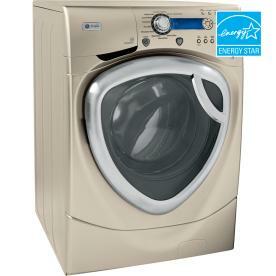 With a total of eight wash and spin speed combinations, the unit offers versatility. Created in a stylish and attractive package, the WPDH8800JMG model with its array of functions can be a great addition for any home. The unit is Energy Star-qualified, meeting all federal guidelines for an energy-efficient home appliance. The H2ition Wash System is an innovative feature that allows the machine to automatically sense the size of the load, dispense the correct amount of water necessary and adjust the temperature for efficiency. The SmartDispense Technology allows for additional room for detergent, with a pedestal that can store up to six months of the cleaning agent supply as well as dispense the necessary amounts each wash. It features the Stain Inspector System, a process that adds to the quality of the wash as it powerfully removes some of the most common stain imaginable. It comes with Specialty Cycles for fabrics that require the extra attention in order to preserve quality, including fleece, pet bedding, and performance fabrics. It features the high-end CleanSpeak Communication System wherein the washer and dryer "talks" to each other in order to save time by presetting the one to run after the other. It comes with up to eight washer cycles. It comes with an adaptive fill for water levels. It comes with additional HydroHeater and HydroMotion washer features. It comes with the Luxury Quiet Package. It comes in a stylish champagne color. The door style is see through glass. TrueGrip handle enables better access. Being Energy Star-qualified, the unit is excellent for economical purposes. It saves up time with the CleanSpeak Communication System. The H2ition Wash System makes everything easy by pre-setting each load with the economical amount of water and heat settings. Specialty cycles make it easy to wash special fabrics. The SmartDispense technology eliminates the need to constantly load a cleaning agent each time you wash. The StainInspector System adds quality wash to each load by removing as much stains as possible with the feature capable of recognizing and removing up to 40 stains in all. The unit comes with different washer cycles: 2nd Rinse, Active Wear, Drain and Spin, HydroMotion, PreWash, Quick Rinse, Stain Inspector, and Speed Wash. It comes with a variety of dispensers: Detergent (Liquid/Powder) Timed Flow-Thru, Bleach Timed Flow-Thru, Fabric Softener Timed Flow-Thru, and Pretreat. It allows for a huge load space for larger families. The SmartDispense Technology requires an attachment sold separately. It has no Steam cycle. It has no soak settings. The self-cleaning lint filter is absent. stylish, blends well with the decor. large capacity to accommodate even the largest loads. Join in and write your own page! It's easy to do. How? Simply click here to return to General Electric FRONT LOAD Washing Machines.